Bobby Dollar (Doloriel to the heavenly host) is an earthbound angel, an advocate fighting to keep souls out of hell. After the events of the first novel, his life has been shaken up. He found love in the arms of the demon Casmira, Countess of the Cold Hands. But she’s gone, taken back into hell by the Eligor, one of the Dukes of Hell out of jealous possession. Unable to let her go, Bobby embarks on a dangerous journey into hell itself. He will do anything to save Caz, even lose himself to an eternity of torment. And even if he survives the trip through the layers of hell and finds her, he will have to contend with one of its most powerful ruler. Williams paints a very bleak and disturbing hell. Like Dante before him, he takes you into the darkest pits. But Bobby, unlike Dante, doesn’t just witness the suffering and torment. He lives it. He has to experience the horrors day after day as he treks across its layers and meets its inhabitants. Williams shows the lives of those damned to suffering, how they survive, how they are tormented, how their dystopic societies work. Everything wears down the spirit and you suffer it with Bobby. It is powerful writing and a great follow-up to the Noir detective novel of the first book. Williams takes his world into the fantasy quest with seamless effort. The journey through hell is one of the most macabre that I have written, with imagery that will haunt you. It is clear the author put a lot of effort into his imaging of how Hell would function, from its different classes of people, each with their own motivations and dreams, to the vagarious ways they are tormented. Happy Hour in Hell is a dark, disturbing, and powerful read. Fans of Urban Fantasy need to check out his series and understand why Tad Williams is a huge name in the world of fantasy literature. 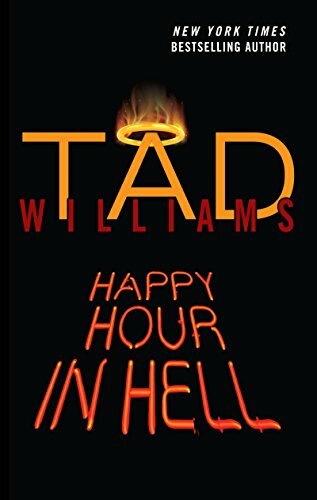 You can buy Happy Hour in Hell from Amazon!